Timeless beauties, Our Walnut Plaque collection features walnut finish or walnut wood material. 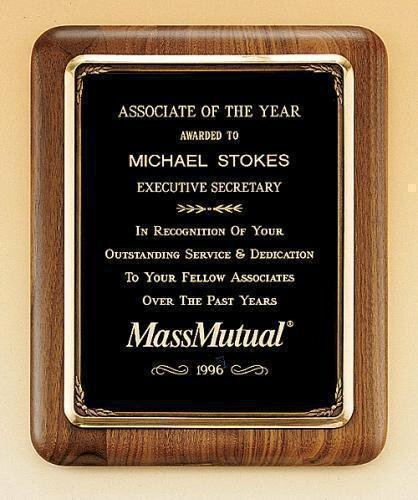 These plaques have traditionally presented recipients with a very elegant award. Walnut has been the proven standard for fine plaque awards for many years. American walnut plaque with furniture finish and an antique bronze finish frame casting. Furniture finish American Walnut Plaque with an antique bronze finish frame casting. Individually boxed. Made in USA. PRICING INCLUDES ENGRAVING ! Solid American walnut plaque with silk-screened braided border design. . Individually boxed. Solid American walnut plaque with decorative brass accents. Individually boxed. American walnut eagle casting plaque with finely detailed eagle casting with black and gold finish. Individually boxed. Solid American walnut plaque with a large eagle casting and three color American flag. Individually boxed. Great for recognizing a Veteran ! PRICING INCLUDES ENGRAVING !